Home > Retouching varnish: protect your painting and restore the gloss! There are various different varnishes available on the market. The temporary intermediate varnish is called retouching varnish. You can use this varnish a few months after the painting has dried. You use the retouching varnish as a temporary protective layer on your painting. It is a protective layer for filling up the porous film of oil paint, to protect it against dust and moisture. A retouching varnish ensures that the painting can still ‘breath’. The paint must be left to dry for at least a month. Once the paint is really dry, you can subsequently apply a final varnish over the retouching varnish. Secondly, you can use the retouching varnish for retrieving matt ‘sunken-in’ areas. Some pigments, e.g. umber and lead white contain metals that allow the oil to dry faster. Once the oil paint has expanded by approx. 20% during the drying process, it will sink again. The fast-drying paints become matt, while other colours are still glossy. The unity of the glossy tone of the painting is lost. By applying retouching varnish to the matt areas, you restore the gloss to the matt colours. During varnishing, neither the space nor the work may be damp. The ideal temperature in your working space is best kept at 22 degrees centigrade. Apply the varnish with a 5 cm wide hog bristle spalter brush, crosswise in four directions. You do not need to remove retouching varnish before you apply the final varnish. This retouching varnish is a painting varnish thinned with white spirit and contains approx. 20% synthetic ketone resin. 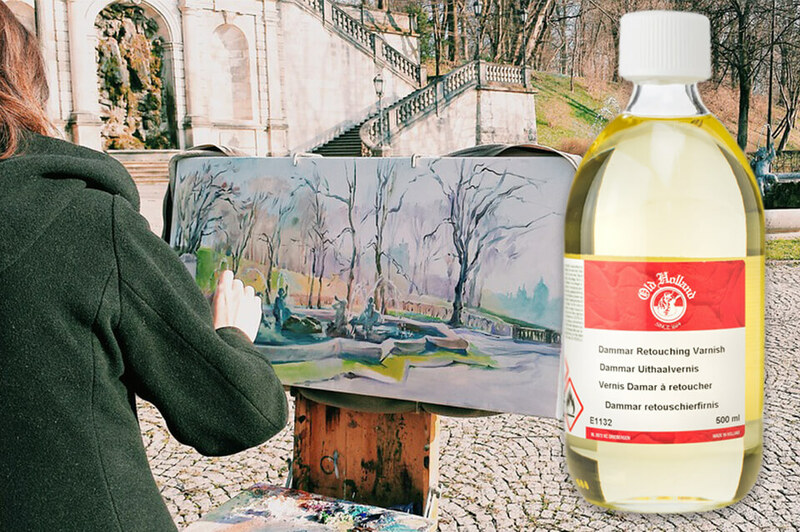 This retouching varnish contains 17% damar resin, which is not dissolved in white spirit but in turpentine. We wish you every success with varnishing your beautiful painting!